What the bug is: Ok, when you click on the red menu button in the game you can type whatever you want if you click on the BP Points you have. You can put anything you want in there, but when you close out of the Menu and open it back up again, it goes back to saying what it originaly was. OK if you look closely you can see that i typed: WTF... Next to BP. This clearly states that this is a bug. I tried what you said and it didnt work. I still dont have the achievement. What the bug is: Where were you? I was fighting the dragon. What did you do right before the bug happened? Well, my account had just been reset by Warlic, and I wanted to go play again. What happened? Well, whenever I swing my weapon, this rainbow-ish like line would pop up, and then after that, the white slash would (sometimes) pop up, showing that I've hit the monster. I'm thinking lag is causing this, or the fact that my account was reset, but I'm not exactly sure. And clearing my cache doesn't help either. Screenshot: I can't take one, because the line doesn't show up whenever I take a picture. Wierd, huh? I also realized that BlueKatz has the same problem as me. Well, try to fix this problem please, thanks. Equipped:I think it was the stick. What the bug is: Well...I got reset. I was at the beginning. It was the same as when I first logged into the game. I've tried clicking load character, playing in another browser clearing cache and all that but im still lvl 1 with 50 hp.. Which is really annoying since I was level 10 with the lvl 10 doom sword and beat the game. What happened after the bug?I was level 1...Other than this everything's fine. Already tried everything on that list as I mentioned, I'll just level it up manually..again. Thanks anyway. What it is: In the survival area you can access the locked icons without completing the task. You are not able to access the rewards though so no one should be "cheating". Each button while still locked takes you to the boss fights. What the bug is: I can equip the above without having to buy any of them. I was in BH Castle, leveled up to 2, then went into Equip Weapons, and tried to equip the Iron Dagger (without buying), and I did. Were you able to recover or work around the bug? What the bug is:Extreme lag. The whole game froze, and after a few minutes it went back on. It just kept happening. Everytime i fight! What happened after the bug?I got kicked once, but after the lag was gone i could continue. Duplication: Were you able to duplicate (did the bug happen again?) after clearing your cache? Yes. Also there's another annoying problem: I play the game a while with all items and thing that I leveled and bought then when buy thing I find out I didn't log in (^ look bug above) Is it possible to make a log in warning when you join the game? Ack! The new Level 10 weapons were NOT supposed to appear in the store :( They are the rewards for completing survival mode. They have been removed - Sorry about that! 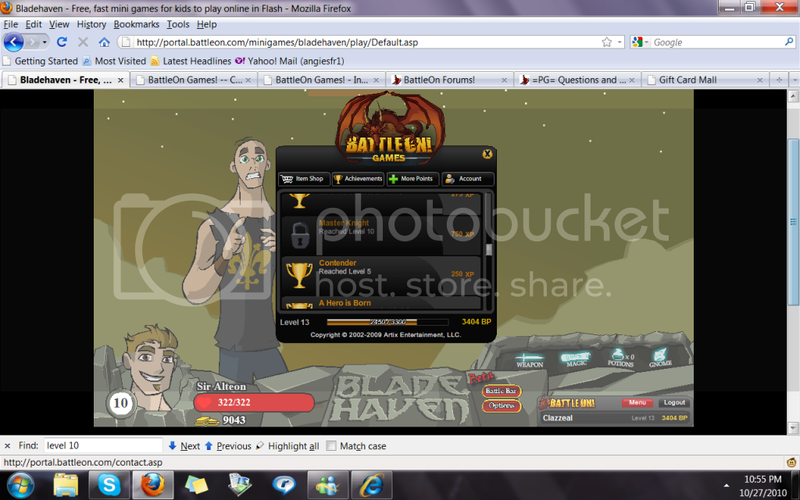 What the bug is: I hit the survival mode button after failing miserably in battle. During the first battle, The monster did not move, but I could still cast spells and summon mercenaries. I could not attack otherwise. the mercenary defeat the monster, and the next monster did the same thing. Accessing menus made the monster instantly kill me. I've been able to do this more then once. Were you able to recover or work around the bug? Details, details, details! What happened after the bug? Things seem to of proceeded as normal. Were you kicked? Did the game freezer? Did play continue normally? @zoomzoom pie: Clear your cache and restart your browser. This usually fixes most problems. I try playing bladehaven, but after the loading bars reaches full it just stops and nothing happens. Not sure if this is because of the game or my browser, but it seriously affects gameplay. What the bug is: I have a sporadic problem where pressing the space bar causes my browser window to scroll down so that the game screen is only half visible in the window. What happened after the bug? Every time this happens, I have to scroll back up and then click on the game screen with the mouse in order to resume gameplay normally. My battling suffers every time this happens. Please include details - where were you? What did you do right before the bug happened? What happened? Ok so after I have already defeated the 75 monsters I still don't have that badge according to my character! I don't have the "Impenetrable" achievement (block 1000 attacks) even though my book says I blocked 1000 times... I fought a few extra monsters, logged out and cleared cache, no change. Were you able to recover or work around the bug? NO! What happened after the bug? I have less HP!